Copywriting agency Immediate Network wanted a copywriter with a journalism background who would be good at writing a press digest for Jaguar Land Rover’s managers. 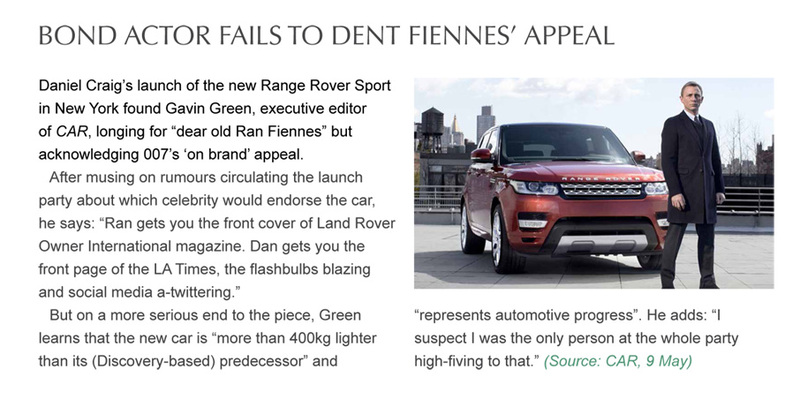 Copy had to summarise JLR’s press coverage in an easy-to-read way, showing media uptake of PR stories to help managers gather intelligence fast. The press digest focused on motoring journalists’ responses to a press release or media campaign. Copy was delivered in 24 hours. I ensured the main angle was always in the first par (see cutting below). News was kept short to ensure busy managers could rapidly take it in. Good corporate communications pulled this project together.